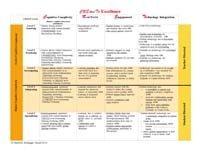 The Create Excellence Framework was developed by Dr. Marge Maxwell, Dr. Janet Tassell, and Dr. Beckie Stobaugh. It was originally based upon work by Moersch (1995) and redesigned by the researchers in 2009. The Framework represents five levels of performance for each component: Cognitive Complexity, Real-World Learning, Technology Integration, and Engagement. Cognitive Complexity is measured using the Revised Bloom’s Cognitive Taxonomy (Anderson & Krathwohl, 2001). The revised Bloom’s Taxonomy framework includes six categories of processes—one most closely related to retention (Remember) and the other five increasingly related to transfer (Understand, Apply, Analyze, Evaluate, and Create). With the revision of Bloom’s original taxonomy, higher-level thinking has been clarified as applying knowledge in new ways and engaging in non-routine problem solving (Anderson & Krathwohl, 2001). We emphasize the importance of student learning with the content (not just the technology) at the Analyze level or higher to be considered higher-level thinking. When a student learns from, interacts with, and has an impact on the actual real world, it is defined as real world or authentic learning in the Real-World Learning component of the Create framework. Herrington and Oliver (2000) pose that an “authentic” learning environment provides authentic contexts that reflect the way that knowledge will be used in real life, authentic activities as close to the real world as possible, access to expert performances and the modeling of processes, multiple roles and perspectives, and authentic assessment of learning within the tasks. Engagement indicates the degree to which students take responsibility for their own learning; partner or collaborate with the teacher, other students, or outside experts; and use/manage resources such as teachers, experts in the discipline, and tools/technology. As students become more engaged in their own learning, they have more choice in learning activities, multiple solutions are accepted, and student collaboration. Building on the constructivist theory, Prensky (2010) calls for a partnering pedagogy—a 21st century method of students and teachers working and collaborating together to produce and ensure student learning while preparing them for a new and different future. Technology Integration involves using technology tools in a new way. It involves transforming the classrooms into an environment where students engage in real-world, critical thinking tasks that involve students and teachers collaborating. Through these tasks students are inspired to innovate. Technology provides tools to enable to process to be effective and efficient. The Technology Integration component of the Create Excellence Framework advocates for this new view of technology integration incorporating critical thinking, authentic applications of knowledge, and student engagement.